Esther Loomis was born on 14 May 1738. She was the daughter of John Loomis and Abigail Ellsworth. Esther Loomis married Joel Roberts. [S137] Elisha Scott Loomis, Joseph Loomis, Page 141/Item 244. Lucy Loomis was born on 15 December 1739. She was the daughter of John Loomis and Abigail Ellsworth. Lucy Loomis died on 7 December 1825 at East Windsor, Hartford Co., CT, at age 85. Year of death is based on age at death in 1820 of 80 or 86. Ursula Loomis was born on 13 July 1740. She was the daughter of John Loomis and Abigail Ellsworth. Ursula Loomis died in 1820. Naomi Loomis was born on 9 April 1743. She was the daughter of John Loomis and Abigail Ellsworth. Naomi Loomis died on 17 October 1749 at age 6. Roger Loomis was born on 9 February 1744 or 1745. He was the son of John Loomis and Abigail Ellsworth. [S52] Henry R. Stiles History of Ancient Windsor II, Vol. II:Pg. 438, 442. Elihu Loomis was born on 15 December 1746. He was the son of John Loomis and Abigail Ellsworth. Elihu Loomis died on 21 August 1751 at age 4. Lydia Loomis was born on 5 October 1748. She was the daughter of John Loomis and Abigail Ellsworth. Lydia Loomis married Elisha Bidwell. Lydia Loomis died in October 1807. [S137] Elisha Scott Loomis, Joseph Loomis, Page 141/Item 250. Child Loomis was the child of John Loomis and Abigail Ellsworth. Child Loomis died in October 1753. Elisha Bidwell married Lydia Loomis, daughter of John Loomis and Abigail Ellsworth. Elisha Bidwell died on 14 March 1834 at Canton, NY. [S325] Lucius M. Boltwood, Thomas Noble, Page 532. [S325] Lucius M. Boltwood, Thomas Noble, Page 514. Ancestor of the Windsor Browns, carpenter, came to Plymouth in the Mayflower, 1620, being then unmarried; in div. of Plymouth lands, 1623, had but one acre of land assigned tohim; but in 1627, in div of cattle, his name, with those of Mary and Martha Brown, occurs, each of them receiving a share in the lot; he d. 1633, invent. presented, Oct 4, 1633. The order of Court on sett. of his est. mentions his having had "divers children by divers wives." Mary, his wid., was second wife and administratrix; and, aside from L15 sett. on his two daus., rec'd the remainder of his est. for suport of her young family. However, that Peter Browne of the Mayflower was the ancestor of the Windsor Browns is specifically disputed today. The General Society of Mayflower Descendants has published a series of books, one on each Mayflower passenger that covers the first five generations of each. [Mayflower Families for Five Generations: Peter Browne by Robert S. Wakefield, vol 7, 1992. It must therefore be concluded that the Peter Brown of Plymouth is NOT the parent of the Peter Brown of Windsor., however, a proven connection to Peter Brown of the Mayflower is Capt. John Brown who married Hannah Owen. Jonathan Brown married Mindwell Loomis, daughter of Nathaniel Loomis and Elizabeth Moore, on 1 October 1696.2,3 Jonathan Brown died on 26 August 1747. [S52] Henry R. Stiles History of Ancient Windsor II, Vol. II:Pg. 118. [S137] Elisha Scott Loomis, Joseph Loomis, Page 132. Mindwell Loomis was born on 20 July 1673 at Windsor, Hartford Co., CT. She was the daughter of Nathaniel Loomis and Elizabeth Moore. Mindwell Loomis married Jonathan Brown on 1 October 1696.1,2 Mindwell Loomis died on 1 March 1767 at age 93. Peter Brown was born say 1632. He married Mary Gillet on 15 July 1638. Peter Brown died on 9 March 1691/92. Ancestor of the Windsor Browns, carpenter, came to Plymouth in the Mayflower, 1620, being then unmarried; in div. of Plymouth lands, 1623, had but one acre of land assigned to him; but in 1627, in div of cattle, his name, with those of Mary and Martha Brown, occurs, each of them receiving a share in the lot; he d. 1633, invent. presented, Oct 4, 1633. The order of Court on sett. of his est. mentions his having had "divers children by divers wives." Mary, his wid., was second wife and administratrix; and, aside from L15 sett. on his two daus., rec'd the remainder of his est. for suport of her young family. However, that Peter Browne of the Mayflower was the ancestor of the Windsor Browns is specifically disputed today. The General Society of Mayflower Descendants has published a series of books, one on each Mayflower passenger that covers the first five generations of each. Mayflower Families for Five Generations: Peter Browne by Robert S. Wakefield, vol 7, 1992. It must therefore be concluded that the Peter Brown of Plymouth is NOT the parent of the Peter Brown of Windsor. Donald Lines Jacobus presented a lengthy analysis of all documentation and traditions in The American Genealogist that concluded that Peter Brown only had three surviving daughters. If you would like to read Jacobus' entire analysis: Peter Brown of Windsor. [S52] Henry R. Stiles History of Ancient Windsor II, Vol. I:Pg. 117-118. Mary Gillet married Peter Brown on 15 July 1638. However, that Peter Browne of the Mayflower was the ancestor of the Windsor Browns is specifically disputed today. The General Society of Mayflower Descendants has published a series of books, one on each Mayflower passenger that covers the first five generations of each. [Mayflower Families for Five Generations: Peter Browne by Robert S. Wakefield, vol 7, 1992. It must therefore be concluded that the Peter Brown of Plymouth is NOT the parent of the Peter Brown of Windsor. Donald Lines Jacobus presented a lengthy analysis of all documentation and traditions in The American Genealogist that concluded that Peter Brown only had three surviving daughters. [S52] Henry R. Stiles History of Ancient Windsor II, Vol. II:Pg. 117. [S739] Robert S. Wakefield, Peter Brown, page 3. [S736] Donald Lines Jacobus, "Peter Brown." Jonathan Brown was born in 1744. He was the son of Jonathan Brown and Naomi Ellsworth. Naomi Brown was born in 1746. She was the daughter of Jonathan Brown and Naomi Ellsworth. Ann Brown was born in 1748. She was the daughter of Jonathan Brown and Naomi Ellsworth. Lucy Brown was born in 1750. She was the daughter of Jonathan Brown and Naomi Ellsworth. Lucy Brown died in 1758. Tryphena Brown was born in 1753. She was the daughter of Jonathan Brown and Naomi Ellsworth. Tryphena Brown died in 1758. Deborah Brown was born in 1755. She was the daughter of Jonathan Brown and Naomi Ellsworth. Deborah Brown died in 1758. Martin Brown was born in 1757. He was the son of Jonathan Brown and Naomi Ellsworth. Martin Brown died in 1758. Justus Brown was born in 1760. He was the son of Jonathan Brown and Naomi Ellsworth. Jonathan Brown was born in 1767. He was the son of Jonathan Brown and Naomi Ellsworth. Ann Ellsworth was born on 25 February 1729/30. She was the daughter of Giles Ellsworth and Hannah Stoughton. Giles Ellsworth was born on 6 September 1732. He was the son of Giles Ellsworth and Hannah Stoughton. Giles Ellsworth died on 29 July 1796 at age 63. [S52] Henry R. Stiles History of Ancient Windsor II, Vol. II:Pg. 212, 213. Reuben Ellsworth was born on 19 February 1736. He was the son of Giles Ellsworth and Hannah Stoughton. Hannah Ellsworth was born on 18 May 1740. She was the daughter of Giles Ellsworth and Hannah Stoughton. Hannah Ellsworth was baptized on 1 June 1740. Jerusha Ellsworth was born on 9 November 1743. She was the daughter of Giles Ellsworth and Hannah Stoughton. Jerusha Ellsworth was baptized on 13 November 1743. Joshua Levett was the son of Josiah Leavitt and Margaret Johnson. Joshua Levett married Hannah Devotion, daughter of John Devotion and Hannah Pond. [S100] Donna Holt Siemiatkoski, Ellsworth, Page 2. Hannah Devotion was the daughter of John Devotion and Hannah Pond. Hannah Devotion married Joshua Levett, son of Josiah Leavitt and Margaret Johnson. David served as corporal in Major John Skinner's troup, 1776. Capt. David Ellsworth was born on 27 March 1742 at Windsor, Hartford Co., CT. He was the son of David Ellsworth and Jemima Levett. Capt. David Ellsworth married Phebe Lyman, daughter of Moses Lyman and Sarah Hayden, on 22 February 1779. Capt. David Ellsworth died on 4 January 1821 at Windsor, Hartford Co., CT, at age 78. [S65] Deanna Holcomb Bowman Thomas Holcomb, Vol. I:Pg. 91/Item 1671. Phebe Lyman was born in 1756. She was the daughter of Moses Lyman and Sarah Hayden. Phebe Lyman married Capt. David Ellsworth, son of David Ellsworth and Jemima Levett, on 22 February 1779. Phebe Lyman died in 1831. [S65] Deanna Holcomb Bowman Thomas Holcomb, Vol. I:Pg. 66/Item 6467. 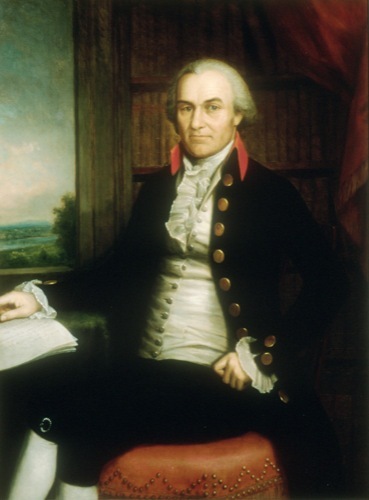 Chief Justice Oliver Ellsworth was born on 29 April 1745 at Windsor, Hartford Co., CT.5 He was the son of David Ellsworth and Jemima Levett. Chief Justice Oliver Ellsworth was baptized on 5 May 1745 at Windsor, Hartford Co., CT. He married Abigail Wolcott, daughter of William Wolcott and Abigail Abbott, on 10 December 1772.5 Chief Justice Oliver Ellsworth died on 26 November 1807 at Elmwood, Windsor, Hartford Co., CT, at age 62.5 He was buried at Palisado Cemetery, Windsor, Hartford Co., CT.5 His estate was probated in 1808 at Hartford, Hartford Co., CT.
Donna Siemiatkoski has written a book on the descendants of Oliver in cooperation with the Ellsworth Memorial Association and the Connecticut DAR. It is available in major genealogical libraries and from the Ellsworth Genealogy Book Committee, Oliver Ellsworth Homestead, 778 Palisado Avenue, Windsor, CT 06095 for $30 plus $3.20 shipping and CT sales tax of 6%. Oliver graduated in 1766 from Princeton University, New Jersey (A.B.) He was a young attorney at the time of the struggle for Independence and served a variety of roles in the colony and state government. He was only 42 when he attended the Constitutional Convention. His most renowned roles were as a framer of the Constitution, the first Senator from Connecticut, third Chief Justice of the Supreme Court, and envoy to Napoleon's court. He is buried under a white obelisk with his wife and oldest son in the Ellsworth section. [S52] Henry R. Stiles History of Ancient Windsor II, Vol. II:Pgs. 212-219. [S65] Deanna Holcomb Bowman Thomas Holcomb, Vol. I:Pg. 92/Item 1672. [S100] Donna Holt Siemiatkoski, Ellsworth, Page 17/Item 1. [S25] Hannah McPherson, Holcombe Genealogy, Page 14.1/Item A-1-6-7-2. [S100] Donna Holt Siemiatkoski, Ellsworth, page 17. Abigail Wolcott was born on 8 February 1756 at East Windsor, Hartford Co., CT. She was the daughter of William Wolcott and Abigail Abbott. Abigail Wolcott married Chief Justice Oliver Ellsworth, son of David Ellsworth and Jemima Levett, on 10 December 1772.3 Abigail Wolcott died on 4 August 1818 at age 62. She was buried at Palisado Cemetery, Windsor, Hartford Co., CT.
[S52] Henry R. Stiles History of Ancient Windsor II, Vol. II:Pg. 809. [S132] Chandler Wolcott, The Family of Henry Wolcott, Page 74/Item 195-5. William Wolcott was born on 21 July 1711. He was the son of William Wolcott and Abiah Hawley. William Wolcott married Abigail Abbott, daughter of Abiel Abbott and Abigail Grant, on 26 February 1746 or 1747. William Wolcott died on 22 May 1799 at age 87. [S132] Chandler Wolcott, The Family of Henry Wolcott, Page 73/Item XXVI (86). Abigail Abbott was born on 25 November 1718. She was the daughter of Abiel Abbott and Abigail Grant. Abigail Abbott married William Wolcott, son of William Wolcott and Abiah Hawley, on 26 February 1746 or 1747. William Wolcott was born on 6 November 1676. He was the son of Simon Wolcott and Martha Pitkin. William Wolcott married Abiah Hawley, daughter of Ephraim Hawley and Sarah Welles, on 5 November 1706. William Wolcott died on 26 January 1749 at age 72. [S52] Henry R. Stiles History of Ancient Windsor II, Vol. II:Pg. 802. [S132] Chandler Wolcott, The Family of Henry Wolcott, Page 55/Item XII (27). Abiah Hawley was the daughter of Ephraim Hawley and Sarah Welles. Abiah Hawley married William Wolcott, son of Simon Wolcott and Martha Pitkin, on 5 November 1706. Abiah Hawley died on 16 June 1716. Simon Wolcott was born in 1625. He was the son of Henry Wolcott Sr. and Elizabeth Saunders. Simon Wolcott married Joanna Cook, daughter of Aaron Cooke and Mary Ford, on 19 March 1657. Simon Wolcott married Martha Pitkin on 17 October 1661. Simon Wolcott died on 11 September 1687. Simon was but five years old when his father emigrated to America. he remained n England with his two sisters until the family had effected a settlement in this country; they came over within ten years after, but the exact time of their arrival has not been ascertained. He was admitted a freeman in 1654. The four sons of Simon located themselves on the main street in East, now South, Windsor. The two eldest, Simon and Henry, about a mile south of the present meeting house--the latter on the west side of the street; the third, William, about a quarter of a mile further north on the same side; and the fourth, Roger, about a third of a mile north of the meeting-house, also on the west side fo the street. The residence occupied the site of Henry's house and the materials of the latter were used in its construction. It stood on a knoll or ridge fronting the east and survived the longest of all the early Wolcott homes. The great tree stood in the street opposite. [S132] Chandler Wolcott, The Family of Henry Wolcott, Page 42/Item IV. Martha Pitkin was baptized on 12 December 1639 at Berkhamsted, Hertfordshire, England.2 She married Simon Wolcott, son of Henry Wolcott Sr. and Elizabeth Saunders, on 17 October 1661. Martha Pitkin married Capt. Daniel Clark, son of Rev. Sabbath Clark and Elizabeth Overton.2 Martha Pitkin died on 13 October 1719 at age 79. ". . . in 1661, Martha Pitkin, a young lady of reported charm and beauty, came to Connecticut unescorted, seeking to persuade her brother William, recently appointed King's Attorney for the colony of Connecticut, to return with her to London. . . She arrived to find her brother feeding his pigs, and the remark she made then has come down in history: 'I left one brother in England serving his king, and found another in America serving his swine.' "
The elders and Martha's brother conspired to keep her in Connecticut and introduced her to Simon. Living in England in 1631; died without issue, in England previous to the date of his father's will in 1655. John Wolcott was born on 1 October 1607 at England. He was the son of Henry Wolcott Sr. and Elizabeth Saunders. John Wolcott lived in 1631 at England. He died before 1655. [S132] Chandler Wolcott, The Family of Henry Wolcott, Page 34/Item 1. Came to America with his father in 1630; died unmarried; estate divided among his brothers and sisters, Henry being the chief legatee. Christopher Wolcott was born at England. He was the son of Henry Wolcott Sr. and Elizabeth Saunders. Christopher Wolcott died on 7 September 1662. [S132] Chandler Wolcott, The Family of Henry Wolcott, Page 35. Henry Wolcott was born on 21 January 1610/11 at England. He was the son of Henry Wolcott Sr. and Elizabeth Saunders. Henry Wolcott married Sarah Newberry, daughter of Thomas Newberry, on 8 November 1641 at Windsor, Hartford Co., CT. Henry Wolcott died on 12 July 1680 at age 69. Henry came to America with his parents and was admitted a freeman by the General court at Boston, April 1, 1634, which shows that he was at that time a member of the Dorchester Church. He removed with the family to Windsor in 1636 and is listed as one of the founders of that town. He was an importing merchant, and his ledger has been preserved. He appears to have been in England on business in the spring of 1654. He was engaged in public life, and held various appointments; was one of the nineteen gentlemen prominent i the Colony who were named in the Charter of Connecticut. He was elected a member of the House of Deputies in 1660, and of the House of Magistrates in 1662, and successively after that, until his death. He was master of a shorthand to which we did not imagine that any key could ever be found. Among the papers deposited in the library of the Connecticut Historical society, many years since, was a stout little vellum-covered volume of nearly four hundred pages, closely written in this hand, with no clue to the subject nor to the writer's name. It lay unnoticed until about the year 1857, when it attracted the attention of J. Hammond Trumbull, LL. D., who succeeded in deciphering it, and found it to consist of notes of sermons and lectures, delivered in Windsor and Hartford, between April, 1638, and May, 1641, in regular course. The writer's name is not given, but his birthday is noted on the first leaf of the volume, in the words, the day I was born was the 21 of Jan. 1610, and this and other facts identified him as Henry Wolcott, Jr; and it is a curious fact that the only record of his birth is found among these hieroglyphics. The alphabet made use of is nearly the same with that of Willis (published in 1607) but the great number and variety of arbitrary signs introduced by the writer made the task of deciphering a difficult one. [S52] Henry R. Stiles History of Ancient Windsor II, Vol. II:Pg 800. [S132] Chandler Wolcott, The Family of Henry Wolcott, Page 40/Item II (3). [S132] Chandler Wolcott, The Family of Henry Wolcott, page 40. George was made a freeman in Conn. 21 may 1657. He settled at Wethersfield. George Wolcott was the son of Henry Wolcott Sr. and Elizabeth Saunders. George Wolcott died on 12 February 1662 at Weathersfield, Hartford Co., CT.
[S52] Henry R. Stiles History of Ancient Windsor II, Vol. II:Pg. 800. [S132] Chandler Wolcott, The Family of Henry Wolcott, Page 41/Item III. Martin Ellsworth was born on 12 January 1750. He was the son of David Ellsworth and Jemima Levett. Martin Ellsworth died on 7 May 1751 at age 1. Jemima Ellsworth was born on 13 March 1751/52. She was the daughter of David Ellsworth and Jemima Levett. Jemima Ellsworth married Oliver Mather, son of Nathaniel Mather and Elisabeth Allyn, on 28 March 1778. Jemima Ellsworth died on 9 September 1803 at South Windsor, CT, at age 51. Oliver Mather was born on 21 March 1749 at Windsor, Hartford Co., CT. He was the son of Nathaniel Mather and Elisabeth Allyn. Oliver Mather married Jemima Ellsworth, daughter of David Ellsworth and Jemima Levett, on 28 March 1778. Oliver Mather died on 27 August 1829 at age 80.